Rhizobium cells attach specifically to cells of root hair and enter the cells. 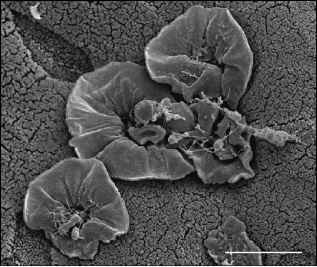 The Rhizobium cells invade other cells through an infection thread synthesized by the root hair. Rhizobium cells develop into bacteroids, which pack the enlarged plant cells. Nodule consists of enlarged plant cells packed with bacteroids. Figure 30.14 Symbiotic Nitrogen Fixation (a) The major steps leading to the formation of a root nodule in leguminous plants by Rhizobium. 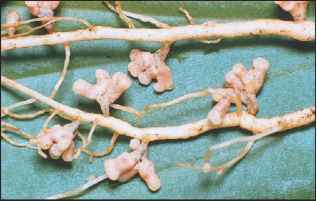 (b) Root nodules. Azolla ferns. Then, as the rice grows, it eventually crowds out the ferns. As the ferns die and decompose, their nitrogen is released into the water. The rumen functions as an anaerobic fermentation vessel to which nutrients in the form of plant materials are intermit tently added. In some cases the animal produces over 150 liters of saliva per day. In addition to providing water, the saliva also contains bicarbonate, a buffer, which helps maintain the pH. A remarkably complex variety of microorganisms degrade the ingested material, liberating sugars that are then fermented, producing various organic acids. Each milliliter of rumen content contains approximately 1010 bacteria, 106 protozoa, and 103 fungi. Of the over 200 species identified in the rumen, no single one accounts for more than 3% of the total flora. The organic acids released during fermentation are absorbed by the cells that line the rumen, providing the animal with an energy and nutrient source. Copious quantities of gas are produced as a result of fermentation, which are discharged when the animal belches. bial population gets the first opportunity to use the nutrients that are ingested. The animal then uses the end products of microbial metabolism as well as the microbial cells themselves. The cecum of non-ruminant herbivores serves a similar function as a rumen, but because it follows the stomach, there is no anatomical mechanism to utilize the microbes as a food source. The benefit of this arrangement, however, is that the animal can digest and absorb readily available nutrients without competition from microbes.